When it comes to Mario Kart Tour, you can count everything we know about it on one hand. 1) There’s a Mario Kart mobile game in development. 2) The mobile game is to release between now and end of March, 2019. 3) Mario Kart Tour is the product of Nintendo and DeNA. 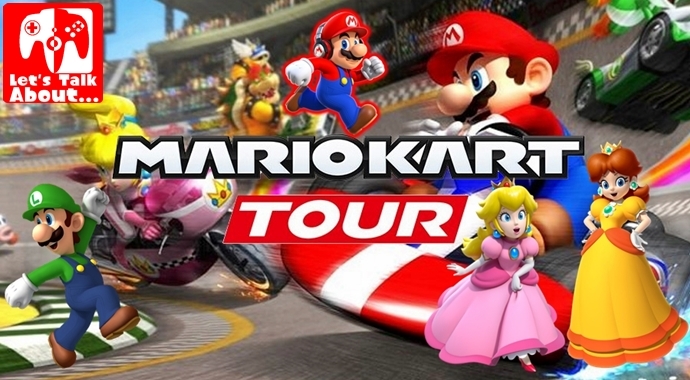 4) DeNA CEO states Mario Kart Tour will be free-to-start. Soon enough, the details will start flowing and we will know all that there is to know, especially the closer we get to the release of the mobile instalment, but as I sit here in my chair, typing all of this, I only want to know one thing, will Super Mario Run tie-in with Mario Kart Tour with regards to the unlockable characters? Ever since the announcement came that support for Miitomo will be brought to an end this May, I started to think about the same thing happening to the other apps. Fire Emblem Heroes and Animal Crossing: Pocket Camp will both be celebrating their first anniversaries this year, but come December, Super Mario Run will be 2 and it is not the success story it could have been. Despite more than 200 million downloads, Super Mario Run never grossed anything even close to that, as only around 10% or less, of users ever bothered to purchase the full game ($9.99 US dollars, when the game wasn’t discounted due to being on sale, when the Remix update rolled out last year.) User retention wasn’t ever all the impressive either, as many who played the game, soon bid farewell to it when the Switch and Fire Emblem Heroes came along, so with Miitomo going this year, what’s to stop the same from happening with Super Mario Run? Now that Mario Kart 8 Deluxe and Super Mario Odyssey are out on Switch and are 2 of the best-selling titles on Switch, with Mario Tennis Aces due out for release this year, Super Mario Run has done its job and unless there’s a sudden desire to give it more content to keep it relevant, Super Mario Run, will soon become obsolete and just like Miitomo, everything we put into it, would be for nothing, because with no more support, there’s no more Super Mario Run! So, when the app goes, characters like Luigi, Peach, the various different coloured Yoshis, Toad, Toadette and even Daisy, who took time, effort and even a bit of cash to get, if you were in a hurry, would be for nought, unless Mario Kart Tour can save them? What if, as well as featuring some characters that can be unlocked for free, with others hidden behind purchases, Mario Kart Tour allows you to sync your My Nintendo account with Super Mario Run and unlocks any character you’ve acquired already, as a racer? Straight away you might think this would then affect in-app purchases for Mario Kart Tour, as it would, but it might just prompt players to return to Super Mario Run. It could be a full year before Mario Kart Tour comes out and in that time, aspiring Mario Kart Tour players, could actually buy the full Super Mario Run experience and unlock every in-character that Super Mario Run has to offer, in the hopes of playing them from the get-go from the second Tour releases. It would also be a move that prompts mobile gamers to actually play 2 of Nintendo’s mobile games, get more caught up with the mobile Mario experience and become even more likely to go out, buy a Switch and purchase any of the Mario games that are available already/releasing later this year. It the biggest thing it would do though, is properly connect the mobile games. In the past, we’ve seen the Miis from Miitomo being used for My Nintendo and Super Mario Run, and the occasional tie-in event to celebrate the launch of a game, but letting you play as characters you’ve obtained in one game, in another, would be something else entirely. I know I touched on something similar in my Fire Emblem Heroes successor editorial I also penned today, but Nintendo say the apps aren’t performing as well as they could be and I say Nintendo are failing to make the most of them. My Nintendo and the mobile games would benefit even more so if Nintendo took the time to connect them to each other more so than they are now. For example, think of it this way, Miitomo is ending, but what if you could transfer some of the clothes you got in the app, to Animal Crossing: Pocket Camp? Granted not all of them would work in the app, and not everyone likes Animal Crossing, but it’s a way of giving back and keeping a part of Miitomo alive, long after it’s gone. This is what the mobile apps should be about. Not just about the series’ they represent, but by connecting the apps more so than they are now, players will go from solely being interested in 1 or 2 of the Nintendo mobile games, to playing more of them, purely because of the incentive Nintendo have created. Despite being a failure, Miitomo could live on, and so could Super Mario Run, long after it’s eventually gone, thanks to Mario Kart Tour letting you straight away play as any character you have already obtained in the one-handed auto runner. It’s not just a neat little thing Nintendo could do, but just a little more connectivity between the apps and Nintendo can ensure each game will have a future, even when they have become lost to the past and make more even money from the games then they are now. Still, that’s just my thoughts and feelings on the matter, what are yours?